Thursday November 29th 1894 Thanksgiving Day. I got the morning work done and Will and I went in home to dinner. Mother had a nice tirkey for dinner. John & Hatt were invited over to Rich's with Ott & Fanny. It looked like snow and we came home before it was late. Friday November 30th 1894 I was busy all forenoon cleaning up the silver and fixing up the sideboard. Will went down to get a load of sand for the chickens. He got the pieces to finish the ceiling to the kitchen and in the afternoon got them on besides giving the hen house a complete going over. I swept the front part of the house. Saturday December 1st 1894 Ott is thirty-five years old today. I was at home at work all day long. I put up sitting room curtains, washed windows and I did dusting to finish the house cleaning. I dressed chicken, stewed pumpkins, cooked beets, baked pies and cleaned the kitchen in the afternoon. Will took the butter in after dinner. It was a foggy day and got dark early. I was too tired to do anything at night. Sunday December 2nd 1894 A bright cold winer day. We went to church and spent the rest of the day at home doing our work and reading a little. The chickens are still ailing, more have died. 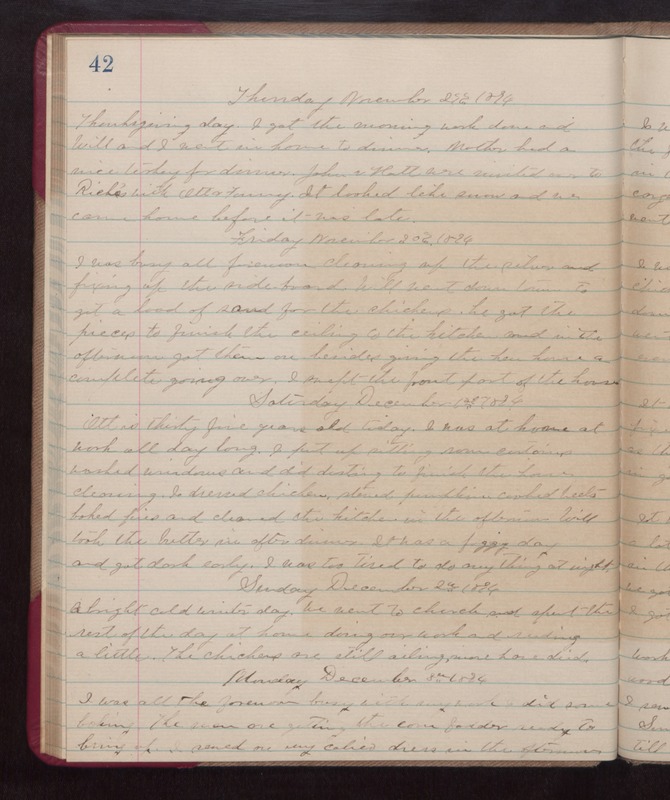 Monday December 3rd 1894 I was all the forenoon busy with my work. I did some baking. The men are getting the corn fodder ready to bring up. I sewed on my calico dress in the afternoon.